That’s what some would say as I sit here on my own while my good Ladymarra is partying on down at Solfest. I had a LOT of fun putting it together and it enabled me to play some tracks by good people who I’ve been meaning to give some recognition too for a while as well as make a couple of discoveries along the way. As usual here’s the track listing all the artists have links to their websites, Facebook or MySpace, just click on their name to go there. There’s no link on mine of course as the address is at the top of the page. Right now my website is in serious need of updating too so it’s not the hot fount of all knowledge that it once was. Also omitted from the links is Virginia Barrett, the web address on her CD doesn’t work anymore and a Google search couldn’t locate her in the time I had to look. But please check out the acts below as they all need your support. 13 STARS are a Carlisle based band with a no messing about attitude to what they do and it’s a glorious slice of country pie that get served up. Though perhaps “Americana” is the better term as that’s where 13 Stars sit. The rise of Americana over the past few years is slowly taking over the Country scene, some would say it’s a result of the Coen Brothers “Oh Brother Where Art Thou?” but it was probably on the way anyway, and a good thing too. But these Cumbrians can teach the Colonials a thing or two about how to do, beautiful stuff and I sincerely regret not putting these guys on a stage (yet, there will be a time in the future without a doubt). The link is to their Facebook, but this one to their Soundcloud is probably a better one to actually find out about the band and get some music from them too! Anything that I can do to stop people from using Facebook is good too as it surely is a creation of the devil. Yes I know I have a Facebook page. But that’s run for me by Laurence and I have no input in it except when I ask him to (such as a link here for the new podcast). I much prefer real friends who’ll see me in person or ring me up (actually I rather they didn’t ring me up, emailing’s cool though), anyway enough of Facebook, sod em! ahab (small case all the way, drives your spellcheckers wild) are one of the best new bands to emerge over the past year and i think could easily be the next Mumford & Sons. I had them closing the stage at Nuts In May and though they were a sadly depleted band due to an injury the rocked the house (house meaning small grassy glade in front of The Jack In The Green Stage). JACK HARTLEY Has for a good while now been a mover and shaker on the Cumbrian new folk music scene, along with PADDY ROGAN and LOUISE MARTIN as the core of the excellent THE RIGHTEOUS BEES but his solo work is excellent too and I would have played some of his stuff a good while ago but Ladymarra had at some time had a tidyfrenzy and his album “The Egremont Apple” disappeared from the eyes of mortal man. I finally found it last week when I looked right in the far back reaches of a deep drawer and found a shrivelled piteous thing clinging on to it, calling it it’s precious. I wish could say pity stayed my hand, but no, I grabbed the CD and gave pathetic little squelcher a sound kicking!!! Here’s a vid of the Bees to go with it. Over the years I’ve had literally hundreds of submissions come through the door. From over produced and over packaged super glossy affairs sent by some agency who perhaps hopes that by dazzling you with packaging you’ll not notice that the music isn’t as good as it might be, to self produced demos copied off from a PC and a handwritten name and email address in marker on the top, track listing optional. So what I did for this podcast was literally stick my hand in the pile and pick out four CDs to include in this podcast and play a track from each (a dangerous move as I could have pulled a turkey out) and here they are. Sadly I can’t find anything about Virginia anywhere, so sad as she has a really enchanting voice. To Be Continued, but the need to get everything online takes precedent and I’ll finish this as and when. See I wasn’t just saying it more writing has appeared as if by magic and before I do anything else I must honour a promise I made to my good friend Cameron Phillips who has mentioned me in his rather excellent blog HOWLING IN THE DARK I advise scrolling down the page to the August 22 (2012) entry and then scroll upwards when you’ve read downwards to the bottom of that first entry. Come on, you know how these blogs work. It’s well worth the read though, Cameron is a very funny guy and his blog is good reading, informative too as I learnt about things I’d done and forgotten about long ago. SID WRIGHT Is another whose CD has been lost to the Ladymarra Tidyfrenzy where exactly it’s gone is a mystery that would stump Holmes, Poirot and any other you can care to name. But a search did reveal his earliest (possibly) demo sent me and this track is from that. He’s doing really well these days writing books as well as songs and more power to his elbow for that as he deserves it all. Outroads were one of the acts from the very first year of the Drystone Stage and were also one of the first to get a return booking. I’m not sure if they are still together, which if not is a great shame. Neverland have also (I believe) split up, again a great shame as this Midlands based outfit had a really good following and reputation for quality as the track suggests. Of Pikey Beatz I can’t really say anymore than I’ve said in previous blogs, again I must thank them for the name credit on their EP “Better Late Than Never” but as a further addition to my ongoing celebration of all things Pikey here’s a video of them on my stage at NUTS IN MAY. I think that’s all I want say for now, loadsalove and back soon with more stuff. 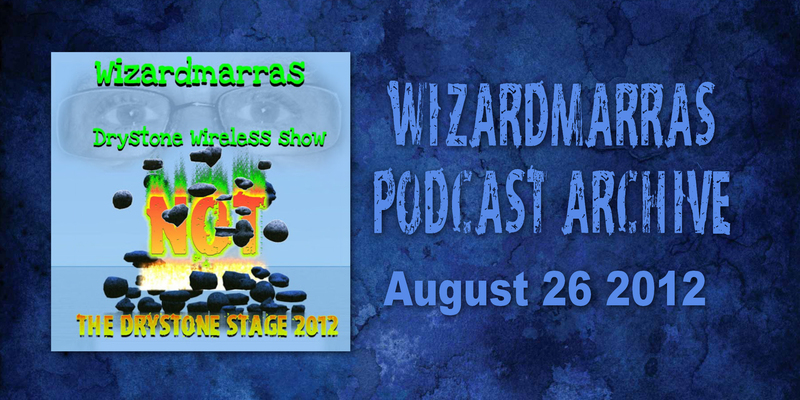 This entry was posted in Best New Musicians & Great Music Videos, The Wizardmarra's Wireless Show Podcasts and tagged Best New Musicians, Great Music, Music Videos, Musicians & Artists, Podcasts by Alan Whittaker. Bookmark the permalink.